The medical research programme provides a wide breadth of study opportunities. The insights I've gained moving to Tasmania and completing a degree prior to my medical degree have proved an exceptional asset."" I'm currently working at the Walter and Eliza Hall Institute in Melbourne as a Research Assistant in the field of Immunology Mathematical Modelling. 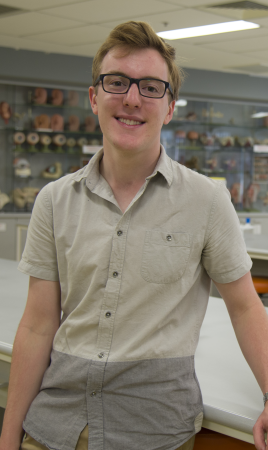 In 2015 I completed the Bachelor of Medical Research (BMedRes) at the University of Tasmania and will take up a place in their Bachelor of Medicine/Bachelor of Surgery (MBBS) course through the Guaranteed Entry Scheme. Early in 2013 I received my offer for the BMedRes. I realised what a fantastic opportunity I was presented with. The Guaranteed Entry Scheme meant not only did I have a clear pathway into medicine, but I also had the opportunity to explore a wide breadth of studies before entering the intense medical course. In retrospect, I feel the insights I've gained moving to Tasmania and completing a degree prior to my medical degree have proved an exceptional asset. The medical research programme provides a wide breadth of study opportunities. The lecturers at the University of Tasmania come from diverse backgrounds. Especially in later years of your degree the lecturers are active researchers in the specific field they are lecturing in. This intimate knowledge of the content they are presenting provides a unique insight into that lecture content. The University of Tasmania is in a truly unique position in that lecture sizes are small enough that students and lecturers can develop a rapport; but large enough to have world class research facilities. Through the University I was awarded an Undergraduate Research Opportunities Scholarship giving me the opportunity to work with a research group at the University. This fantastic opportunity allowed me to test and challenge the theory I had learnt in lectures in a practical setting. If you are offered a place in the BMedRes have a go at all the opportunities that the University presents - both social and academic. Whilst study is an important part of the University experience it is by no means the only part. A balance is essential to making the most out of the experience. Join the societies, go hiking and play in a band – if you're having fun then you won't get tired of studying.